This article is about the film. For the television series, see All Dogs Go to Heaven: The Series. For the Supernatural episode, see All Dogs Go to Heaven (Supernatural). Sullivan Bluth Studios Ireland Ltd.
All Dogs Go to Heaven is a 1989 animated musical fantasy directed and produced by Don Bluth, and released by United Artists and Goldcrest Films. It tells the story of Charlie B. Barkin (voiced by Burt Reynolds), a German Shepherd that is murdered by his former friend, Carface (voiced by Vic Tayback, in his penultimate film role), but withdraws from his place in Heaven to return to Earth, where his best friend, Itchy Itchiford (voiced by Dom DeLuise) still lives, and they team up with a young orphan girl named Anne-Marie (voiced by Judith Barsi, in her final film role; movie released postumously), who teaches them an important lesson about kindness, friendship and love. The film is an Irish, British and American venture, produced by Sullivan Bluth Studios Ireland Ltd. and Goldcrest Films. On its cinema release, it competed directly with Walt Disney Feature Animation's The Little Mermaid, released on the same day. While it did not repeat the box-office success of Sullivan Bluth's previous feature films, An American Tail, and The Land Before Time, it was successful on home video, becoming one of the biggest-selling VHS releases ever. It inspired a theatrical sequel, a television series, and a holiday direct-to-video film. 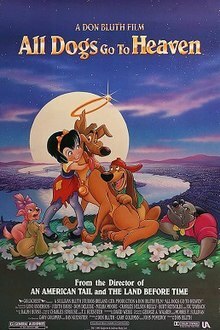 All Dogs Go to Heaven was released on DVD on November 17, 1998, and as an MGM Kids edition on March 6, 2001. It had a DVD double-feature release with its sequel on March 14, 2006, and January 18, 2011. The film was released in high definition for the first time on Blu-ray on March 29, 2011, without special features except the original theatrical trailer. In 1939 New Orleans, Charlie B. Barkin and his best friend Itchy Itchiford escape from the dog pound and return to their casino riverboat on the bayou, formerly run by Charlie himself and his business partner, Carface Caruthers. Refusing to share the profits with Charlie, Carface had been responsible for Charlie and Itchy getting committed at the pound and persuades Charlie to leave town with 50% of the casino's earnings. Charlie agrees, but is later intoxicated and killed by Carface by getting run over by a car. He is sent to Heaven despite never actually doing any good deeds in his life, where he meets a whippet angel (later known as Annabelle), who tells him that a gold watch representing his life has stopped. He steals the watch and winds it back, returning to Earth, but is told that when the watch stops again, he will not return to Heaven and will end up in Hell instead. After reuniting with Itchy, they discover that Carface has kidnapped a young orphaned girl named Anne-Marie, who has the ability to talk to animals and gain knowledge of a race's results beforehand, allowing Carface to rig the odds on the rat races in his favor. They rescue her, intending to use her abilities to get revenge on Carface, though Charlie tells her that they plan to give their winnings to the poor and help her find some parents. The next day at the race track, Charlie steals a wallet from a couple as they talk to Anne-Marie and become alarmed by her unwashed appearance. Charlie and Itchy use their winnings to build a successful casino in the junkyard where they live. Anne-Marie, upon discovering that she had been used, threatens to leave. To persuade her to stay, Charlie brings pizza to a family of poor puppies and their mother, Flo, at the old abandoned church. While there, Anne-Marie becomes upset at Charlie for stealing the wallet. She goes to the attic and wishes to live with the couple in the future. After a nightmare in which he is sent to Hell for eternity, Charlie wakes up in the room, only to find Anne-Marie gone. The couple, Kate and Harold that she met, welcome Anne-Marie into their home. While they privately discuss adopting her, Charlie arrives and tricks her into leaving with him. Walking home, Charlie is shot by Carface and Killer, but finds that he is unable to be harmed as long as he is wearing the watch, rendering him immortal until it stops running. Anne-Marie and Charlie hide in an abandoned building, but the ground breaks and they fall into the lair of King Gator, an effeminate oversized alligator. He and Charlie strike a chord as kindred spirits and he lets them go, but Anne-Marie starts falling ill with pneumonia. After beating up Itchy, Carface and his thugs destroy Charlie and Itchy's casino. Itchy berates Charlie, who seems to care more about Anne-Marie than him. Charlie angrily declares that he is using her and will eventually "dump her in an orphanage". Anne-Marie overhears the conversation and tearfully runs away before she is kidnapped by Carface, and Charlie follows them. Flo, hearing Anne-Marie's scream, sends Itchy to get help from Kate and Harold, and he rouses the dogs of the city by his side. Charlie returns to Carface's casino, where he is ambushed by Carface and his thugs. They attack Charlie, inadvertently setting an oil fire that soon engulfs the whole structure. Charlie's pained howls from their attacks summon King Gator, who arrives and chases Carface off. Charlie drops his watch into the water, however, he pushes Anne-Marie to safety onto some debris, and dives into the water to retrieve it, but it stops before he can get to it. Anne-Marie and a redeemed Killer are discovered by Itchy, Flo, Kate, Harold, and the authorities, as the boat sinks into the water. Sometime later, Kate and Harold adopt Anne-Marie, who has also adopted Itchy. Charlie returns in ghost form to apologize to Anne-Marie. The whippet angel appears and tells him that because he sacrificed his life for Anne-Marie, Charlie has earned his place in Heaven. Anne-Marie awakens, and they reconcile. Charlie asks her to take care of Itchy, and bids his sleeping friend goodbye. When Anne-Marie goes to sleep again, Charlie reluctantly leaves and returns to Heaven where Carface finally arrives, having been caught and eaten by King Gator. A post-credits scene shows Carface ripping off his angel wings and halo while planning to get his revenge against King Gator by taking one of the clocks; until he is warned by the whippet angel that if he takes the clock, he can "never come back" before being chased by her. The film ends with Charlie watching Carface getting chased away, until he looks at the audience and says "He'll be back" before winking and retrieving his halo. Burt Reynolds as Charlie B. Barkin, a brash German Shepherd/Collie mix and a former con artist. The character was designed specifically with Reynolds in mind for the role and the animators mimicked some of his mannerisms. Reynolds is succeeded by Charlie Sheen for All Dogs Go to Heaven 2, and Steven Weber for All Dogs Go to Heaven: The Series and An All Dogs Christmas Carol. The model for the character of Charlie was a German Shepherd, appropriately named Burt. Burt the dog often spent time with the animators at the studio, even going with them during the studio's move to Ireland. Dom DeLuise as Itchy Itchiford, a paranoid, anxious but loyal Dachshund. DeLuise reprised his role in All Dogs Go to Heaven 2, the series and An All Dogs Christmas Carol. Judith Barsi as Anne-Marie, a 7-year-old orphan girl with the ability to talk to and understand animals. Her singing voice was performed by Lana Beeson. This was Barsi's final film role before her murder in 1988. The ending credits song "Love Survives" was dedicated in her memory as her character became absent in the further franchise. Vic Tayback as Carface Caruthers, a violent, sadistic mixed American Pit Bull Terrier/Bulldog gangster. This was Tayback's final film role before his death in 1990. For All Dogs Go to Heaven 2, All Dogs Go to Heaven: The Series and An All Dogs Christmas Carol, Ernest Borgnine took Tayback's role. Charles Nelson Reilly as Killer, a misnamed, fidgety, neurotic and spectacles-wearing Schnoodle who is Carface's comic relief sidekick. Reilly was the second original voice actor that reprised his role in the series and An All Dogs Christmas Carol except for the sequel. Loni Anderson as Flo, a female Rough Collie and Charlie's friend. Melba Moore as a Whippet angel who welcomes deceased dogs into Heaven. She was named "Annabelle" in the sequel. Bebe Neuwirth succeeded Melba in the role. Ken Page as King Gator, an American alligator and voodoo witch doctor living below the streets of New Orleans. Rob Fuller and Earleen Carey as Kate and Harold, a married couple who later become Anne-Marie's adoptive parents. Godfrey Quigley as Terrier, a dog that appears when Itchy tells everyone Anne-Marie is in danger. Anna Manahan as Stella Dallas, a horse that appears when Anne-Marie, Charlie, and Itchy are at the derby. She is against the Once Upon a Wintertime Team. Candy Devine as Vera, a female gambling dog. The earliest idea for the film was conceived by Don Bluth after finishing work on The Secret of NIMH. The treatment was originally about a canine private eye, and one of three short stories making up an anthology film. The character of a shaggy German Shepherd was designed specifically for Burt Reynolds. However, Bluth's first studio, Don Bluth Productions, was going through a period of financial difficulty, ultimately having to declare bankruptcy, and the idea never made it beyond rough storyboards. The concept was revived by Bluth, John Pomeroy and Gary Goldman, and rewritten by David N. Weiss, collaborating with the producers from October through December 1987. They built around the title All Dogs Go to Heaven and drew inspiration from films, such as It's a Wonderful Life, Little Miss Marker and A Guy Named Joe. The film's title came from a book read to Bluth's fourth-grade class, and he resisted suggestions to change it, stating he liked how "provocative" it sounded, and how people reacted to the title alone. During the production of their previous feature film, Sullivan Bluth Studios had moved from Van Nuys, California, to a state-of-the-art studio facility in Dublin, Ireland, and the film was their first to begin production wholly at the Irish studio. It was also their first to be funded from sources outside of Hollywood, the previous two feature films, An American Tail and The Land Before Time, had been backed by Amblin Entertainment and Universal Pictures, and executive producers Steven Spielberg and George Lucas (for The Land Before Time only) exercised a degree of control over the content of the films, a situation Bluth found disagreeable. The studio found investment from UK-based Goldcrest Films in a US$70m deal to produce three animated feature films (though only two, Rock-a-Doodle and it, were completed under the deal). The three founding members of the studio, Bluth, Pomeroy, and Goldman, had all moved to Ireland to set up the new facility, but during the film's production, John Pomeroy returned to the U.S. to head up a satellite studio which provided some of the animation for the film. Pomeroy also used his presence in the U.S. to generate early publicity for the film, including a presentation at the 1987 San Diego Comic-Con. The film's lead voices, Burt Reynolds and Dom DeLuise, had previously appeared together in five films. For this one, they requested them to record their parts in the studio together (in American animation, actors more commonly record their parts solo). Bluth agreed and allowed Reynolds and DeLuise to ad-lib extensively; Bluth later commented, "their ad-libs were often better than the original script". However, Reynolds was more complimentary of the draft, warmly quipping, "Great script, kid", as he left the studio. Another pair of voices, those of Carface and Killer (Vic Tayback and Charles Nelson Reilly, respectively), also recorded together. Loni Anderson, who voices Flo, was Reynolds' then-wife. Child actress Judith Barsi, who voiced Ducky in Bluth's previous film The Land Before Time, was selected to voice Anne-Marie; she was killed in an apparent murder-suicide over a year before All Dogs Go to Heaven was released. As production neared completion, the studio held test screenings and decided that some of the scenes were too intense for younger viewers. Writer and producer Pomeroy decided to shorten Charlie's nightmare about being condemned. Co-director Gary Goldman also agreed to the cut, recognizing that the concession needed to be made in the name of commercial appeal. Don Bluth owned a private 35-mm print of the movie with the cut-out scenes and planned to convince Goldcrest Films on releasing a director's cut of the film after returning from Ireland in the mid-1990s, but the print was eventually stolen from Bluth's locked storage room, diminishing hopes of this version being released on home media (though the cut-out scenes of Charlie's nightmare about being condemned was discovered by YouTube on October 29, 2016, therefore The Land Before Time was not included the cut-out scenes (due to produced by Amblin Entertainment). The music for All Dogs Go to Heaven was composed by Ralph Burns with lyrics by Charles Strouse, T.J. Kuenster, Joel Hirschhorn and Al Kasha. An official soundtrack was released on July 1, 1989, by Curb Records on audio cassette and CD featuring 13 tracks, including seven vocal songs performed by various cast members. The ending credits theme and the theme song of the movie "Love Survives" was dedicated to Anne-Marie's voice actress Judith Barsi, who was shot by her father, József, along with her mother, Maria, before the film's release on July 25, 1988. All Dogs Go to Heaven received mixed reviews from critics, maintaining a 55% approval rating on Rotten Tomatoes based on 11 reviews, and a 50 out of 100 score from Metacritic. Reviewers often drew unfavorable comparisons to The Little Mermaid, criticizing the disjointed narrative, the quality of the animation, and the songs by Charlie Strouse and T.J. Kuenster. The film received a "thumbs down" from Gene Siskel and a "thumbs up" from Roger Ebert on a 1989 episode of their television program At the Movies. While Siskel found it to be "surprisingly weak" given director Don Bluth's previous works, due largely to its "confusing story" and "needlessly violent" scenes, Ebert was a huge fan of the movie's "rubbery and kind of flexible" animation, stating he felt it was a good film despite not being an "animated classic". Some also found the darker subject material objectionable in a family film, given the film's depictions of death, violence, drinking, smoking, gambling, murder, demons, and images of Hell. Other reviews were mostly positive, with critics praising the film's emotional qualities, humor, and vibrant color palette. Roger Ebert, who was unimpressed with Bluth's previous film An American Tail, gave it three out of four stars, remarking that the animation "permits such a voluptuous use of color that the movie is an invigorating bath for the eyes," and that although he preferred The Little Mermaid, which opened on the same day, he still found Dogs to be "bright and inventive." However, film critic Leonard Maltin gave it one-and-a-half out of four stars, due to "unappealing characters, confusing storytelling, and forgettable songs." Dissatisfied with the terms imposed by Universal Studios, which had distributed their previous two films, the studio found an alternative distributor in United Artists. Somewhat unusually, production investors Goldcrest Films covered the cost of the release prints and the promotional campaign, in return for a greatly reduced distribution fee from UA. This was similar to the arrangement with United Artists when they distributed Bluth's first feature film, The Secret of NIMH. Goldcrest Films invested $15 million in printing and promoting the film. Due to contractual issues, very little tie-in merchandise accompanied the film's theatrical release; a computer game adaptation for the Commodore Amiga system (with a free software package) was released, and restaurant chain Wendy's offered toys with their Kids' Meals or regular fries. The film opened in North America on November 17, 1989, which was the same day as Disney's 28th full-length animated motion picture The Little Mermaid; once again, Sullivan Bluth Studios' latest feature would be vying for box-office receipts with Disney's, just as their last two films (An American Tail and The Land Before Time) had. On its theatrical release, while still making its budget of $13.8 million back, the film's performance fell short of Sullivan Bluth Studios' previous box-office successes, grossing $27 million in North America alone, just over half of what An American Tail and The Land Before Time each took. All Dogs Go to Heaven received a nomination for "Best Family Motion Picture: Adventure or Cartoon" at the 11th annual Youth in Film Awards ceremony, being beaten by Disney's The Little Mermaid. The home video release received an Award of Excellence from the Film Advisory Board. All Dogs Go to Heaven was released on VHS, S-VHS, 8mm video and LaserDisc in both regular and special CAV standard play editions by MGM/UA Home Video on August 28, 1990. The film became a sleeper hit due to its home video release; a strong promotional campaign helped it become one of the top-selling VHS releases of all time, selling over 3 million copies in its first month. A DVD version was made available for the first time on March 6, 2001, under the MGM Kids label and was later released as a double feature with All Dogs Go to Heaven 2 on March 14, 2006. On March 29, 2011, the film made its debut on Blu-ray, which was later included as a bundle with its sequel on October 7, 2014, along with a re-release of the compilation on DVD. The Blu-ray version was also packaged with another Don Bluth film, The Pebble and the Penguin, on October 8, 2013, and again with eight other MGM films as part of the company's 90th anniversary "Best of Family Collection" on February 4, 2014. The success of the film, particularly its performance on home video, prompted several follow-up productions. A theatrical sequel, All Dogs Go to Heaven 2, a television series, All Dogs Go to Heaven: The Series and An All Dogs Christmas Carol, a Christmas television movie based on Charles Dickens' A Christmas Carol, were made. Don Bluth and his studio had no involvement with any of them, and Burt Reynolds did not reprise his role as Charlie after the first film; he was replaced in the sequel film and television series by Charlie Sheen and Steven Weber, respectively. Charles Nelson Reilly declined to return for the sequel film, but voiced Killer for the television productions. Dom DeLuise played Itchy through the entire franchise. ^ "Sweatbox Animation features". Sweatbox Animation. Retrieved July 28, 2017. ^ "All Dogs Go to Heaven (1989)". Box Office Mojo. Retrieved October 20, 2015. ^ a b "All Dogs Go To Heaven (1989)". RottenTomatoes. Retrieved October 21, 2015. ^ Cawley, John. "Don Bluth American Tail". The Animated Films of Don Bluth. Retrieved October 20, 2015. ^ a b c d e Cawley, John. "Don Bluth All Dogs Heaven". The Animated Films of Don Bluth. Archived from the original on 2014-01-03. Retrieved October 20, 2015. ^ a b "All Dogs Go To Heaven: Various artists". Amazon.com. Retrieved October 20, 2015. ^ "All Dogs Go to Heaven - Original Soundtrack". AllMusic. Retrieved October 15, 2015. ^ "All Dogs Go to Heaven". Metacritic. Retrieved October 25, 2015. ^ Rainer, Peter (November 17, 1989). "All Dogs Go to Heaven (review)". L.A. Times. ^ "Back to the Future Part II / All Dogs Go to Heaven / Henry V (1989)". Siskel & Ebert.org. Retrieved October 30, 2015. ^ Kempley, Rita (November 17, 1989). "'All Dogs Go to Heaven' (G)". New York Times. Retrieved October 20, 2015. ^ Carr, Jay (November 17, 1989). "All Dogs Go to Heaven Review". Boston Globe. ^ a b Ebert, Roger (November 17, 1989). "All Dogs Go to Heaven Movie Review". RogerEbert.com. Retrieved October 20, 2015. ^ Kehr, Dave (November 17, 1989). "All Dogs Go to Heaven Review". Chicago Tribune. ^ "Movie Detail: All Dogs Go to Heaven". The Movie Geek. Retrieved October 26, 2015. ^ "Wendy's All Dogs Go to Heaven Toys". Retro Junk. Retrieved October 20, 2015. ^ "Don Bluth - Box Office". The Numbers. Retrieved October 20, 2015. ^ "11th Annual Awards". Young Artist Awards. Archived from the original on 2015-09-06. Retrieved October 21, 2015. ^ "Film Advisory Board, Inc". Film Advisory Board. Retrieved December 30, 2014. ^ "All Dogs Go to Heaven [ML101868]". LaserDisc Database. Retrieved October 25, 2015. ^ "All Dogs Go to Heaven [ML102043]". LaserDisc Database. Retrieved October 25, 2015. ^ Steven, Mary (August 24, 1990). "All Animals Go To Heaven And To Video". Chicago Tribune. Retrieved October 29, 2015. ^ "All Dogs Go to Heaven". Amazon. Retrieved October 25, 2015. ^ "All Dogs Go to Heaven 1 and 2 (Double Feature)". Amazon. Retrieved October 25, 2015. ^ "All Dogs Go to Heaven Blu-ray". Blue-ray.com. Retrieved October 25, 2015. ^ "All Dogs Go to Heaven 1 and 2 Blu-ray". Blue-ray.com. Retrieved October 25, 2015. ^ "All Dogs Go to Heaven 1 & 2". Amazon. Retrieved October 25, 2015. ^ "All Dogs Go to Heaven/The Pebble and the Penguin Blu-ray". Blue-ray.com. Retrieved October 25, 2015. ^ "MGM Best of Family Collection Blu-ray". Blue-ray.com. Retrieved October 25, 2015. Cawley, John (October 1991). The Animated Films of Don Bluth. Image Pub of New York. ISBN 0-685-50334-8. Lenburg, Jeff (June 2006). Who's Who in Animated Cartoons: An International Guide to Film and Television's Award-Winning and Legendary Animators. Applause Books. p. 32. ISBN 1-55783-671-X.